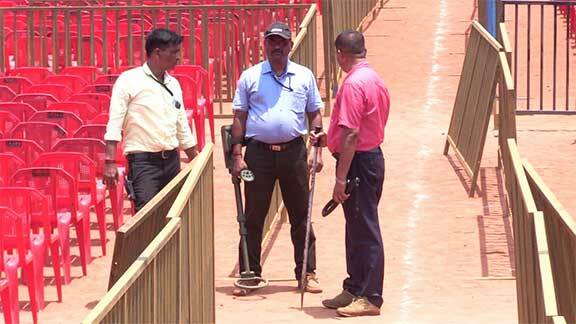 Mangaluru: Tight security arrangements are in place to ensure Prime Minister Narendra Modi’s visit to the city on Saturday April 13. He will be addressing his ‘Vijay Sankalp’ election rally at the football ground of Nehru Maidan here at 3 pm on Saturday. As a security measure, security personnel have been deployed around the venue and all along the route from the airport. Including the main entrance there are six entrances to the venue and all attendees of the rally will undergo through security checks at all entry points. BJP leaders from both Dakshina Kannada and Udupi districts will be on the dais along with Modi. The stage in question has dimensions measuring 60×40 feet. Total 1.5 lakh people from Dakshina Kannada, Udupi and Kasaragod districts are expected to witness the rally. Six LED screens have been set up at the venue for their convenience. Marquees (shamiyana) have been put up to provide shade from the summer heat. Although drinking water is available, no refreshments will be provided due to the model code of conduct being in effect. Sitting MP Nalin Kumar Kateel who is also BJP’s Dakshina Kannada candidate for Lok Sabha election visited the venue and inspected the security arrangements along with other local leaders on Friday April 12. Speaking to reporters he said, “This rally will set a new record in the political history of Dakshina Kannada district. It will be a bigger rally than the one in 2014,” he claimed and added that BJP workers from 1,861 booths in Dakshina Kannada will be attending the rally. The programme at the venue is scheduled to begin at 3 pm. However, the PM will be reaching the venue at 4:15 pm until which, speeches will be delivered by BJP leaders. Scores of BJP workers are expected to participa6te in the rally dressed as chowkidars to boost BJP’s ‘Main bhi Chowkidar’ campaign.